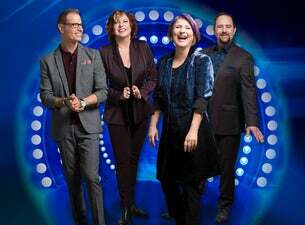 Big Apple jazz fusionists and a cappella masters The Manhattan Transfer have been putting their one-of-a-kind spin on vocal music since the late '70s, and they continue to wow in concert with swinging sets full of playful covers and funky originals. After the passing of singer and founding member Tim Hauser in 2014, booming bass/baritone Trist Curless of LA-based a cappella group m-pact stepped in to fill his shoes – and he's a perfect fit. In concert the band is an electrifying embodiment of their upbeat downtown sound, bopping around while they deliver their pitch-perfect vocals and encouraging fans to clap along to the jazzy rhythms of their ace drummer. The group's signature guy-girl vocal interplay sounds fresher than ever, and ticket buyers lucky enough to see them work their magic will be humming favorites like "The Boy from New York City" and "Route 66" all the way home. The Manhattan Transfer was formed in 1969 by Tim Hauser and an early lineup that appeared on the group's 1971 debut album Jukin'. Hauser parted ways with the band's first incarnation a few years later, and in 1975 he and a new roster released The Manhattan Transfer's self-titled sophomore album. The record was a critical and commercial success, cracking the Top 40 on the Billboard 200 and earning the group their first hit with the song "Operator." A string of popular singles followed in the late '70s and early '80s including "Chanson D'Amour" and "Twilight Zone/Twilight Tone," and in 1982 The Manhattan Transfer became the first group to win Grammys in both the popular and jazz categories ("The Boy From New York City" won Best Pop Performance and "Until I Met You" took home Best Jazz Performance). The Grammy buzz continued in 1985 when their eighth album Vocalese earned 12 nominations, nearly beating Michael Jackson's Thriller for most nominations ever received by a single album. The group maintained a prolific release schedule throughout the '80s and '90s, and in 1998 they were inducted into the Vocal Group Hall of Fame. Hauser and company released six albums during the '00s including An Acapella Christmas and The Chick Corea Songbook, but in 2014 Hauser passed away from a heart attack. Singer Trist Curless stepped in to take his place shortly afterward, and the new lineup continues to honor the band's hallowed vocal legacy with rousing performances on tour.